Museum workshops for school groups: lasting between 1-2 hours, our museum education staff can run a workshop in the museum for your students. 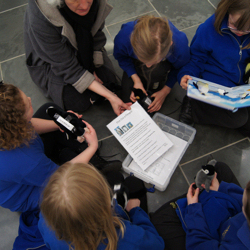 Museum workshops are usually run on Wednesdays and Thursdays only. Museum entry is free but we have a suggested donation of £2 per pupil for taught workshops. A member of the education and outreach team will contact you to discuss the details and content of your visit. All taught sessions support the National Curriculum. See some example sessions for Key Stage 1/2, Key Stage 3 and Post-16 and find out about compatible sessions with some of the other University of Cambridge Museums. 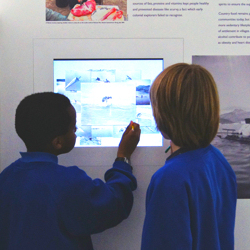 A self-guided visit to the Polar Museum. You will lead your group around the museum. Please note that you will need to book the museum for a self-guided visit. We are happy to lend you clipboards and pencils. When your booking has been confirmed you will be sent an information pack to help with your visit. Museum entry is free but we always appreciate donations! Our Museum Tour is only suitable for an adult group or special interest group. Please note that we charge £100 per group for a museum tour within our normal weekday opening hours. Additional charges may apply for tours outside office hours. Group size is usually limited to 20 adults. 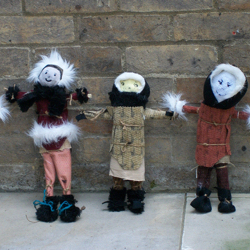 Borrowing a Handling Collection can really help to bring polar education to life in the classroom. We can lend you polar clothing and/or storybags. Loans are for one week only and you will need to collect and return the handling collections to us. Book your handling collection. Handling collections loans are free but we always welcome donations! Training sessions for teachers. Our free session can help you prepare for a self-guided visit. For further information and booking, please visit our events page. Admission FREE, but donations are always welcome. We have a suggested donation of £2 per child for taught workshops. Tours are charged at £100 per group of up to 20 adults. Group size Please note that the museum is small, so group size is generally limited to 20 adults or one school class per half day, plus accompanying adults. Booking Groups must book at least a week in advance using the online booking form. Children must be supervised at all times. Parking We have limited parking available on site for special access needs only, please contact us at least a week in advance to check availability. There are pay and display parking meters on Lensfield Road. Access The museum is accessible by stairs at the front of the building from Lensfield Road and a ramp at the side doors next to the boat. Please let us know in advance if someone in your group has special needs and we will do our best to cater for them. Toilet There is a disabled toilet open to all visitors through the Museum's temporary exhibition gallery. Lunch The Institute regrets that we do not have lunch facilities or room to hang bags and coats. Photography Visitors are permitted to take photographs in the galleries for their personal, educational use only. Please see our photography policy for further details. Shop The museum shop sells books, posters, pens, pencils, rubbers, etc. The Museum is 10 minutes walking distance from both the station and city centre. Other nearby educational attractions include the Fitzwilliam Museum, the Sedgwick Museum of Earth Sciences, the Museum of Archaeology and Anthropology, the Museum of Zoology, the Whipple Museum of the History of Science and the Botanic Gardens. Bookings for group visits to the museum or discuss our education and outreach programmes should be via the booking form above. 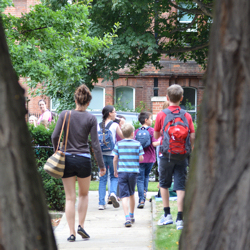 For other queries, to contact us directly please e-mail schools@spri.cam.ac.uk.